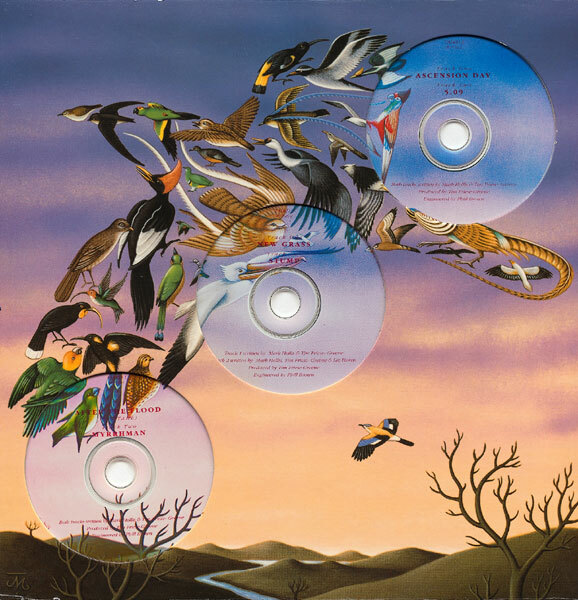 huge” in the U.S. For whatever reason – marketing, packaging, or simply a losing battle for the minds of radio/music TV programmers – Talk Talk was one of those acts that I never knew – or cared – that much about. Of course, I had heard a couple of the singles that broke fairly big world-wide – “Talk Talk” and “It’s My Life” come to mind, although for the latter of the two, I might be thinking of the re-make by No Doubt of the song – but when I went to YouTube to watch the videos, I can’t recall seeing either of them in my younger years. Yet, overseas, their singles and studio albums were always in the Top 100.
with 1986’s The Colour of Spring rising to #8 on the U.K. charts, powered by 4 Top 100 singles, including “Life’s What You Make It”. Song writers often run the risk of delivering music products that are a bit too challenging for mainstream audiences and, in this case, Mark Hollis and his mates seemingly concluded that a non-compromising approach to their song craft on their releases from the late 80’s/early 90’s would appeal to their most-loyal fans. Although the critics generally praised the band’s experiments that would combine rock, ambient, classical and jazz, record-buying fans seemed to lose interest (along, somewhat earlier, with the band’s label, EMI), ultimately causing the collapse of the band in 1992. Today, we can all point at instances of musical acts that stayed true to their creative impulses – Radiohead, Pearl Jam, Morrissey, Fishbone, etc. – and still managed to keep their fan base happy, willing to take a risk on each release whether it kept to “the plan” or not. While the release of this new record should serve to highlight the long-term influence Talk Talk had on musicians in many genres (the record – titled Spirit of Talk Talk, on Fierce Panda Records – www.fiercepanda.co.uk – includes performances by respected rock, jazz, folk and classical artists, packaged in a 2 disc Digipack designed by the subject of today’s interview). Introduction – I first got involved with Talk Talk very early on via their manager Keith Aspden, who I happened to know socially. One day we were discussing how best to represent the band visually – this was prior to any actual releases – he asked me to give the idea some thought and I went away happy to do just that. After some due thought and initial sketches of my ideas, I presented the concept of the “mouth-face” at our next meeting. Putting it simply, the idea all stems from my visual interpretation of the band’s name. The basic premise was liked by everyone concerned, so it was quite easy to put into production and ultimately use it on both the covers of their debut album The Party’s Over and subsequent single. After the image was established, further single covers were required, with my ideas following on in the same vein, continuing the visual identity created for the album and collateral material. I suppose it was a bit like “branding”, in that respect. the necessary material. In the early years, all the artwork was created specifically for each project, though later on, due to urgency and also time limitations, etc., existing images from my archive files were proposed and selected for use whenever we felt that it was appropriate or necessary. had continued, working perfectly well for everyone right up to the very end, and even beyond. image, I’d like to show it to the band”, or words to that effect, which he promptly did and shortly afterwards a unanimous decision was taken to use it. SOE was a case in point, where the image already existed amongst a series of personal paintings, as everyone involved liked the image so much we all agreed to use it for the album cover. I wasn’t expecting that but everyone thought “if the shoe fits…”. The essence of the image just happened to suit the album concept very well, so there wasn’t any need to look further and unusually, the same artwork was deemed fit for both the album and single. The original painting was done back in 1975 and is essentially about Man’s affinity to the sea and its potency. Given that life evolved from the seas, it’s not surprising that most of us are magnetically drawn towards it. 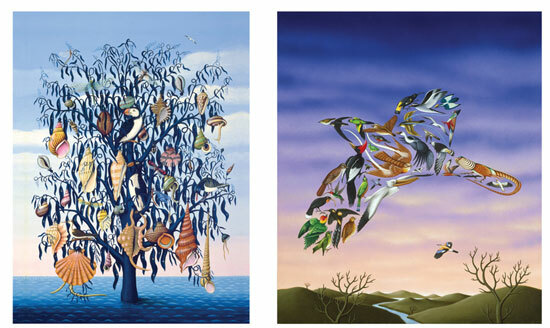 The image itself is really a double metaphor, with both the sea and the tree being major life forces or supports. This work was BC – “Before Computers” – as far as I was concerned. With regards to how long work takes to be produced – I don’t work like a taxi cab driver with a meter running on my desktop, so it takes as long as necessary to complete each job. SOE was a different matter altogether, as it wasn’t commissioned, and so as far as I can recall, the entire process took about a month to complete. There are no tricks or mirrors involved in my painting, just traditional labor methods. Essentially, it’s all about getting what’s in your head down on the canvas. 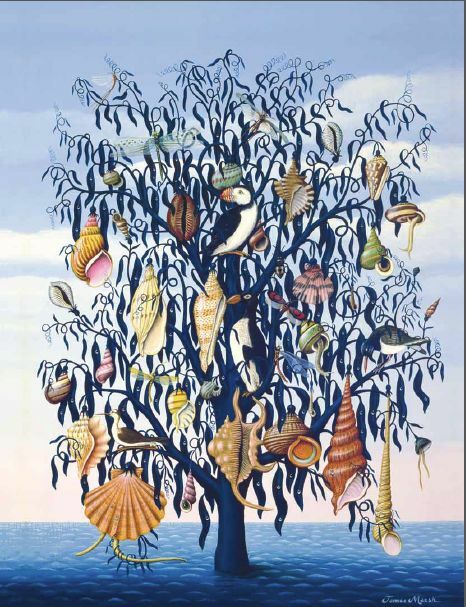 have had to find extensive references for the numerous shells and creatures adorning the tree. After priming a panel or canvas, I normally start by painting the background first, working forwards, so in this instance I would paint the sky initially, followed by the sea as a solid basis for the rest of the image; placing the tree next and adding any details last, literally building up the picture. This method requires a certain understanding of what the image is intended to look like when completed and is obviously helped by creating a sketch or layout beforehand, although I instinctively visualize paintings completed and invariably they work out pretty much as I’d imagined them. the choice, prefer to continue working in this unshackled vein. This painting has a particular resonance for me as it represents a transitional stage in my career and, as a consequence, adds up to being one of my personal favorites from that period. If I had to pick my favorite Talk Talk album it would come down to a choice between The Colour of Spring, as that contains my favorite track, “I Don’t Believe In You”, or SOE, which may just have the edge. The image also happens to be my most requested print order by the way, which I think tells you something about what TT fans like, too. In retrospect, my only disappointment with regards to printing is that the artwork was reduced down too much on all formats, particularly the 12 inch, where it was used at CD scale, making it difficult to appreciate the detailed nature and subtleties of the image. was able to loan me a book about the world’s most endangered bird species of the time, which was the perfect starting place and also saved me a lot of research time. After due thought and initial sketches, I settled on my solution. The visual I presented was of a collection of birds from the endangered species list contained within the shape of a single bird. Simultaneously, I wanted to imply a mood or atmosphere of impending threat to the scene, so I kept it rather sparse and moody. 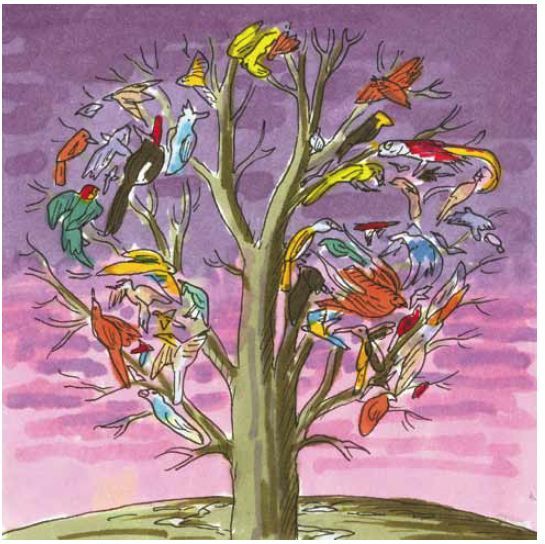 ‘global-tree’ as an alternative, while still incorporating the same selection of birds from the previous painting but this time presenting them within the form of the continents. This became the cover for Laughing Stock, with the first design reverting to serve the box set After the Flood. Everyone involved was happy with the conclusion, although I still maintain the first painting would have made a better album cover. As I’ve previously detailed, the ATF image was created originally for the cover of Laughing Stock but, on presentation, Mark asked me to try another version incorporating a tree, to follow on – in his mind – visually from SOE. However, one consolation for the disappointment I felt when the Flood painting I’d originally promoted for use on the cover for Laughing Stock was the release of a box-set of three CD singles (titled the After The Flood Box Set and released in Sept. 1991 on Polydor Records) from the album, which used the ‘Flood’ painting on the 12 inch box cover and matching picture-discs. A promotional pack for Laughing Stock’was also issued to launch the album. It consisted of a wooden box made from sustainable forest timber which contained a pen, pencils, eraser, ruler, note pad etc. plus a CD and mini print / sticker. I’m pleased now to have ATF produced as a fine art screen print. Unfortunately, it wasn’t reproduced very well on the 3 disc box set, so it’s great to see it printed as intended, plus the image stands up very well to a large format. The same comments apply to SOE – it was used at CD scale originally, even on the 12″ album covers, so all the detail was completely lost on most people. Like all fans at the time, I awaited each album with optimistic anticipation. It was also frustrating for me during the cover design process, because I rarely heard any demos or finished tracks in advance – mainly due to the mastering and production processes running to deadline prior to any actual release. When that time eventually came, and I finally received the finished product alongside any collateral material co-opted for promotion, it certainly felt like a special occasion. It’s always a point of culmination seeing your work in print, particularly if it all turns out well. 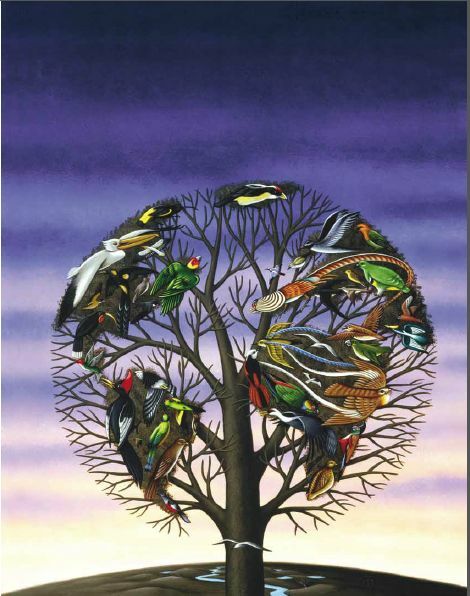 Regardless of the various print aspects though, I always relished unwrapping and playing new Talk Talk albums, essentially because the music never failed to live up to my expectations but also because it felt like some sort of fulfillment. Just for the record, it must be said that I would definitely have been a Talk Talk fan, regardless of my collaborations with them. Over the years I’ve acquired an extensive record collection and, whenever I look through it, I’m mindful that the music we choose automatically becomes a soundtrack to our lives. My well-used Talk Talk section certainly confirms that idea. With regards to my feelings about whether album art matters any more, I’d like to say “yes, album art matters”. It’s like having a sandwich without the bread, unless you rely solely on the radio for your audio entertainment. The music industry is in flux at the moment with album packaging in decline, due to downloading being cheaper amongst other reasons. However a lot of people still prefer to hold a product in their hands – I certainly do. Hopefully there will be a swing back to packaging again, although I don’t expect it will ever be the same as in the 80’s, before CDs. I’m doing my part by providing an affordable service for new bands or individual musicians trying to get their music out there. As I said before, it’s all about getting what’s in your head down on the canvas. Of course, today, even paintings end up digitized via the computer and, consequently, as a designer I’m more productive for it. The computer has undoubtedly given me the opportunity to have complete design control over any project, from visuals through to print-ready files, something never previously possible to any individual “BC”. 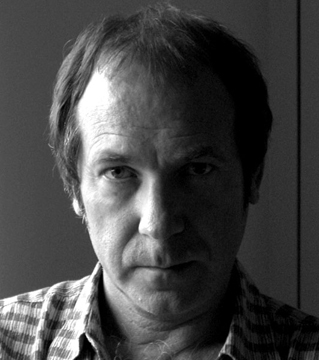 Born in 1946 in Yorkshire, England, James Marsh is a U.K.-based artist, designer, illustrator and writer who has worked in all aspects of the world of visual fine arts, with clients in advertising, publishing and other media. After moving to London in 1965 and graduating two years later with a National Diploma in Design, he started his music graphics-related career at Pie Records, moving soon after to Decca Records and then to join with artist Alan Aldridge (when forming “Ink Studios”) that led him to his most high-profile projects at that time, including their acclaimed book “The Beatles Illustrated Lyrics”, published in 1969, and Andy Warhol’s “Chelsea Girls” posters. covers for Jamiroquai, Steeleye Span, Gerry Rafferty, Erazure and others. In Fall of 2012, James collaborated with Harwood King Fine Art to publish a series of large format, limited-edition screen-prints, launching with two very popular images from his Talk Talk series. 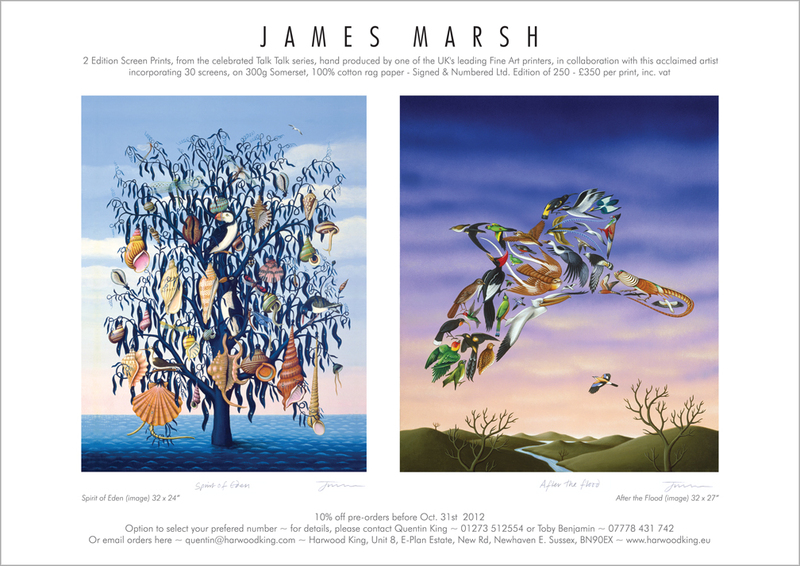 Both titles, ‘ Spirit of Eden’, and ‘After The Flood’ , will be exclusively available as a signed limited edition of 250. Our ongoing series of interviews will give you, the music and art fan, a look at “The Making Of” the illustrations, photographs and designs of many of the most-recognized and influential images that have served to package and promote your all-time-favorite recordings. product you saw then and still see today. We hope that you enjoy these looks behind the scenes of the music-related art business and that you’ll share your stories with us and fellow fans about what role these works of art – and the music they covered – played in your lives. All images featured in this UnCovered story are Copyright 1967 – 2012 James Marsh – All rights reserved – and are used here with his permission. Except as noted, all other text Copyright 2012 – Mike Goldstein & RockPoP Productions for the Album Cover Hall of Fame.com (www.albumcoverhalloffame.com) – All rights reserved.